Most of the work you do on transport in plants concerns the movement of water and minerals from the roots to the leaves of the plants in xylem vessels. (see previous post on xylem transport) You should understand what transpiration is, and how the properties of water allow a transpiration pull provide the energy to move large volumes of water up the xylem in the plant. But what about the second plant transport tissue phloem? How does it differ from xylem in both structure and function? Well structurally the tissues are very different. Xylem vessels are large, dead, empty thick-walled cells with cell walls strengthened with lignin. 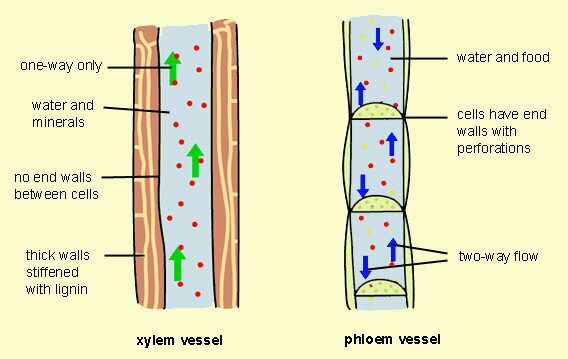 The transport cells in phloem are called sieve-tubes. Phloem sieve tubes are living cells with thin cell walls. In xylem vessels the end walls break down completely but in phloem sieve tubes, the end walls are filled with many holes forming a structure called a sieve plate. 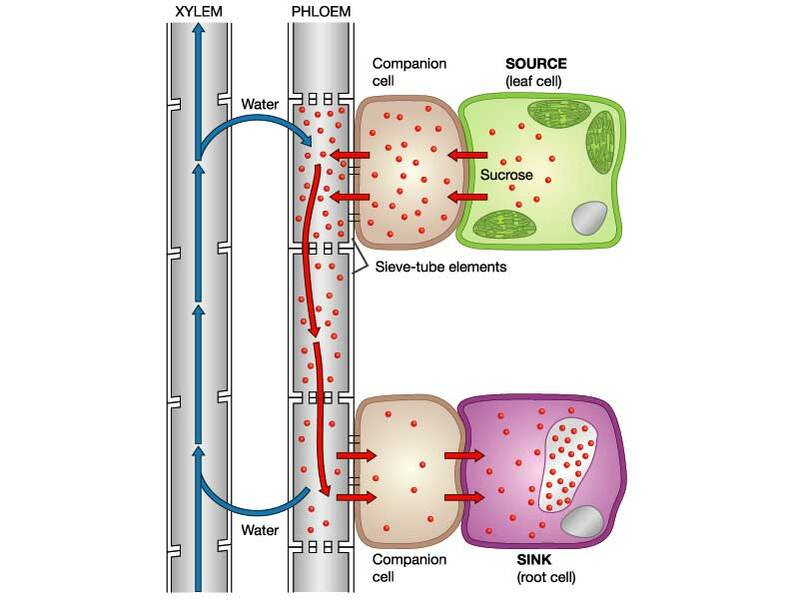 Each phloem sieve tube has a smaller cell called a companion cell alongside and both these two cells must be alive for phloem transport to occur. What is transported in phloem sieve tubes? Plants transport the products of photosynthesis (food molecules) up and down the stem in phloem. The main carbohydrate transported is sucrose but phloem cells also contain lots of amino acids and a few other sugars. The mechanism by which these sugars are moved around the plant is less well understood than for water movement in xylem. Translocation is an active process and requires energy from respiration in the cells. It is possible that a bulk flow exists as shown in the diagram below, but this mechanism cannot be the whole story….. Can you think why? Post a comment if you want to explain some of the difficulties with this theory…..
It’s going to be finish of mine day, however before finish I am reading this fantastic paragraph to incresase my knowledge. I’m pleased you find this post useful. Why are the phloem sieve tubes and the companion cells so essential to each other for their survival? Good questions. No-one really knows what is going on here. The sieve tube is the cell that actually transports the sucrose and amino acids round the plant. And it has to be alive or the transport stops. But companion cells never actually transport any sucrose within them, but they have to be alive too or else transport stops. It is still a bit of a mystery….. Good question though. Why does the phloem have to transport sucrose instead of glucose? Surely transporting glucose is more efficient? This is a really good question but quite tricky to answer. There will be a reason why sucrose is used instead of glucose but I can’t immediately think of it…. See if you can find out and let me know. Thanks. I am not sure I completely accept this explanation. Animals transport glucose in blood plasma and the fact that it is a reducing sugar doesn’t seem to be a problem there. So although it is true that sucrose is a non-reducing sugar, I’m not sure this really explains why it is used to move carbohydrate around the plant. How can a two-way flow in the phloem occur if the sucrose, dissolved in water from the xylem, is moved by a pressure gradient from source to sink? How come there is a two way flow in the phloem and what is this needed for? Sugars are transported around the plant for a variety of reasons. Why might sugars ever need to be transported up from the roots? Well it may be that stored carbohydrate is used in flowers to make nectar… At the start of the spring growing season, plants will need sugars in the growth regions to build new leaf tissue. In both these cases, stored starch may be broken down in the roots, converted into sucrose and moved up the plant in phloem. Hope that answers your question…. Why can’t the cells transport glucose, and instead they turn it into sucrose to transport it? Good question: I don’t know the answer to this straightaway but will try to find out for you. what is the role of the companion cell in phloem transport? and has this question ever been asked in the exam? Good question Nate. I don’t think you need to worry about this for your exam. But the role of the companion cell is not totally clear. We know they must be alive in order for sucrose transport in the sieve tube to take place. They also play a role in pumping sucrose into the phloem sieve tube in the leaves where it is made and pumping it out in the roots for storage. Thanks Katey – I am pleased you find the site helpful.